Mmm…doesn’t that look delicious? Kind of gets you ready for Thanksgiving doesn’t it? If you’re looking for a holiday dessert recipe that won’t put too much of a dent in your diet, boy do we have a surprise for you! Be prepared to delight in dessert guilt-free. 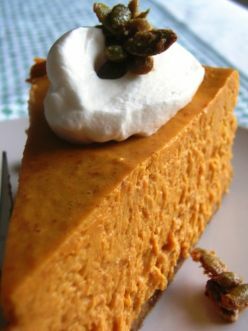 This is a Thanksgiving recipe for those who are interested in counting calories and watching their sugar intake without taking delciousness out of dessert! 1. Preheat oven to 300 degrees F. Butter the bottom and sides of 9 ½ inch spring form cheesecake pan. 2. Sprinkle the bottom of the pan with chopped pecans, distribute evenly. 4. Add pumpkin and yogurt, mixing thoroughly on medium speed. Add in eggs one at a time, mixing well after each. 5. Mix in spices and salt.